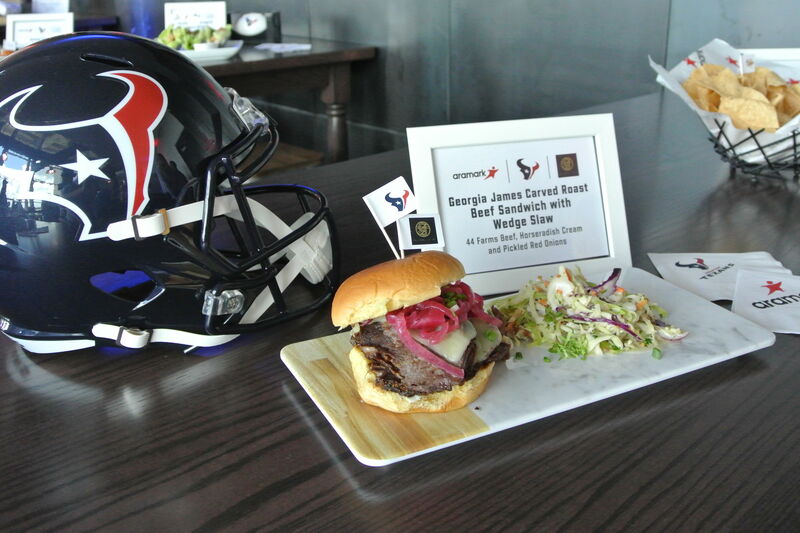 So, what is this new Houston cuisine all about? 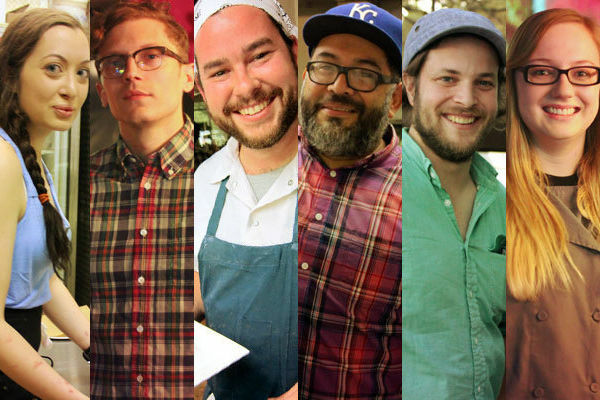 We visited restaurants all over town, sampled dishes, and talked to dozens of chefs and diners. 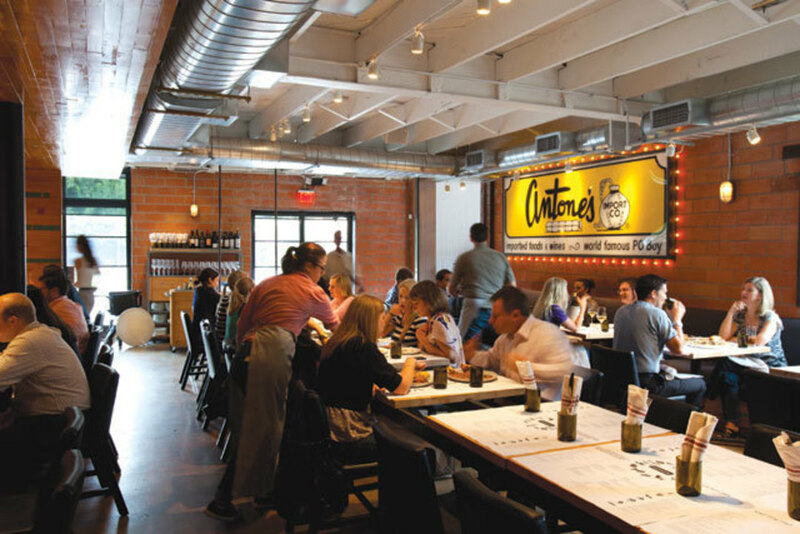 Out of this culinary odyssey came a list of restaurants that define the Houston food scene now. It’s a smorgasbord of dining destinations with lots of nationalities, neighborhoods, and price ranges represented. Here’s the story of Houston’s dining scene in 50 restaurant listings, organized not by rank or alphabetical order, but in the order they came up in the conversation. Click each restaurant’s name for locations, hours, and contact information. There was much discussion about what to call the food at Triniti when it first opened on Shepherd just south of Westheimer. 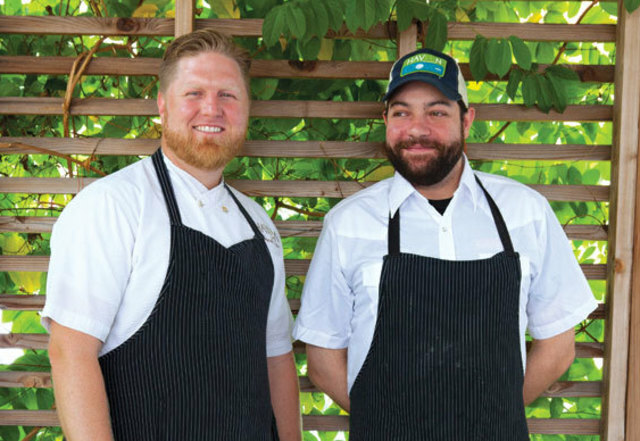 But chef Ryan Hildebrand prefers “progressive American.” It’s an intentionally vague way to describe his keenly modern platings of otherwise old-school Texas ingredients—purple hull peas, beets, peppers, tomatoes, steak, and Gulf fish. You never know what clever creation you’ll find next on Triniti’s wild ride of a menu, whether it’s Gulf oysters with a green papaya nuoc mam mignonette, or poutine made with chorizo, corn gravy, and okra. Keeping us guessing is clearly Hildebrand’s favorite game. Liberty Kitchen & Oyster Bar in the Heights was originally supposed to be a hamburger joint, but at the last minute, owner Lance Fegen decided to turn it into a full-blown restaurant. The idea behind the eccentric “coastal cuisine” menu is simple: “It’s food that I like to eat,” says Fegen, “but I’m a Texas chef and a surfer.” Hence the Spam, egg, and burger patty dish known in Hawaii as a loco moco. Friday’s special is fishermen’s stew with seafood from three coasts. Thursday’s is babi guling, a roast pig cooked over coconut shells that Fegen discovered while surfing in Indonesia. Then there’s Wednesday’s popular fried chicken special—the birds are brined and soaked in buttermilk first—which is accompanied by a tempting combo of bacon cream gravy and hot sauce syrup. More locations are on the way. Your inner traditionalist will love Danton’s, the old-fashioned oyster bar and upscale Cajun/Creole restaurant between the Museum District and Montrose. The mahogany-paneled dining room has a pleasant, throwback vibe that’s echoed in the old-school service. 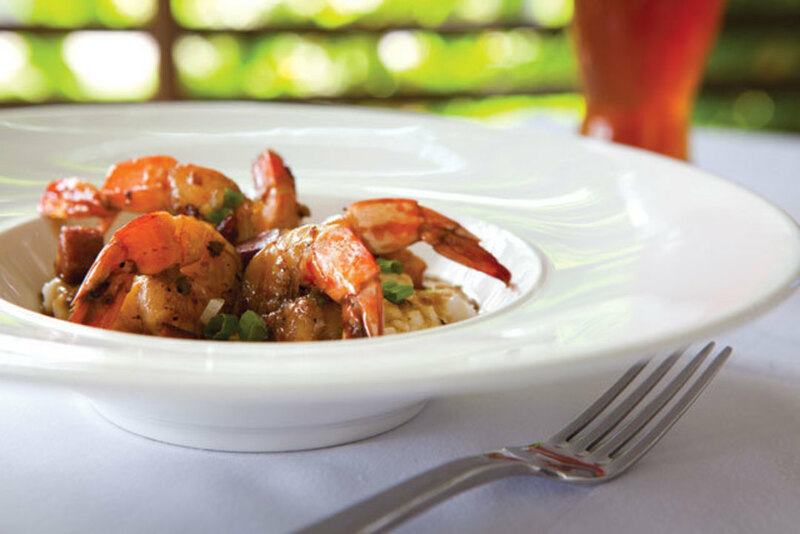 Classic Louisiana dishes include a rich, dark gumbo, shrimp étouffée, and stuffed flounder. 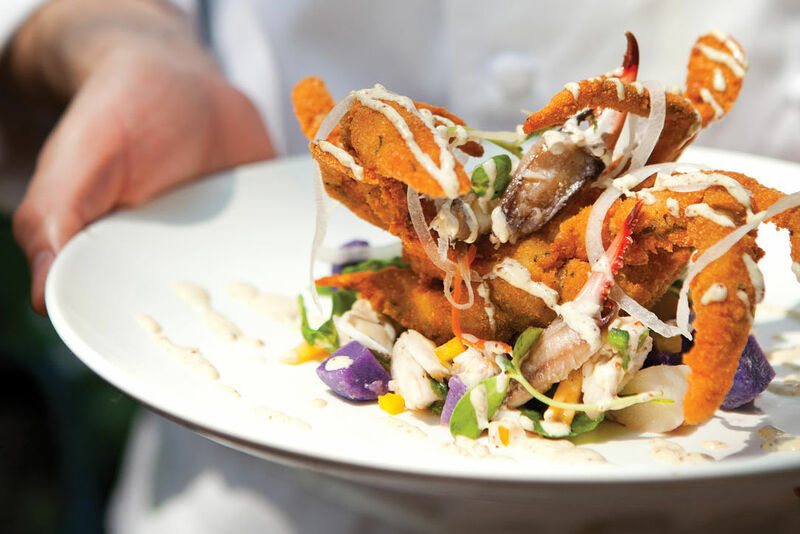 Owner Danton Nix is from Houston, however—and it shows in his Bayou City–inspired dishes, like the Baked Crab Balinese and Oysters Kyle, served in a spicy lemon-butter sauce. 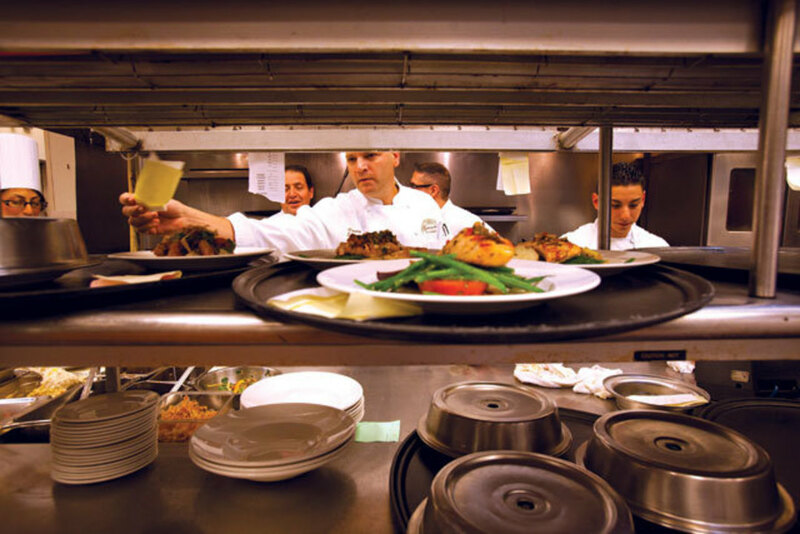 A view into the kitchen at Brennan's. 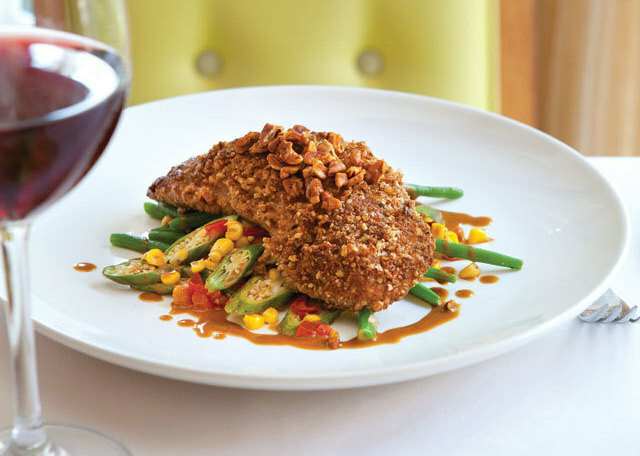 Pecan-crusted Gulf fish at Brennan’s. Brennan’s of Houston, a sister restaurant to Commander’s Palace and distant cousin to the recently closed Brennan’s of New Orleans, first brought Crescent City Creole to the Space City in 1967. The Midtown restaurant is one of the last places in town to serve turtle soup—and it was the first in town to serve soft-shell crab and grits. Chef Danny Trace calls the cooking “haute Creole,” a deftly performed balancing act that keeps the food at Brennan’s both nostalgic and cutting-edge. But that’s nothing new. 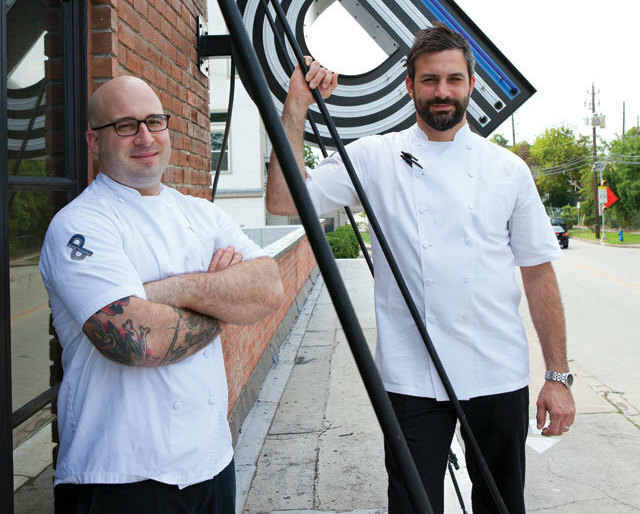 Brennan’s chefs have always been well-versed in the classics, even as they were out in front of every trend: famous alumni include chefs Randy Evans of Haven and Chris Shepherd of Underbelly. The top of the menu at Underbelly reads in part: “We hope you will enjoy Chris Shepherd’s refined take on Houston’s New American Creole Cuisine.” The menu at the Montrose hotspot defines Creole cuisine as “the merging of diverse cultures with local ingredients.” Which means you might find an Italian-Asian combo like Wagyu carpaccio with sesame brittle and pickled nori, or a vegetarian’s dream dish of roasted squash in tahini vinaigrette with boiled-peanut hummus. But there are also straight southern favorites like East Texas “biscuits and gravy” served in a black cast-iron skillet, and you can always get a family-style whole Gulf bycatch fish cooked crispy and served over local vegetable masala. Chefs Randy Evans of Haven and Jean-Philippe Gaston of Cove. Haven and Cove share one roof on Upper Kirby. 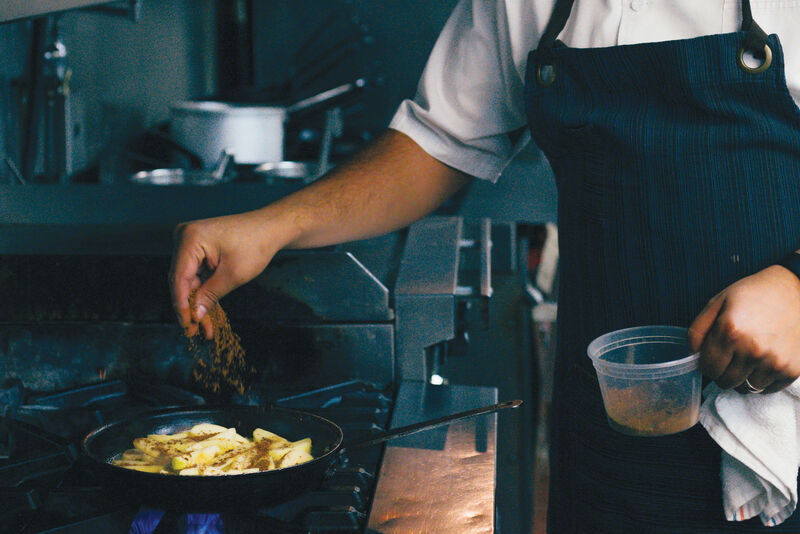 Chef Randy Evans of Haven is largely responsible for the local-foods movement gaining such traction in Houston—first as executive chef at Brennan’s and now at farm-to-table mainstay Haven. Head-on Gulf shrimp and grits, and roasted chicken with bacon spaetzle showcase Evans’s East Texas roots. Meanwhile, over at Cove, Jean-Philippe Gaston, a widely traveled chef, serves multicultural raw-bar items like ika mata from the Cook Islands and oktapodi krasato from Greece. The common bond between the restaurants is a dedication to local ingredients, from the hoja santa in the cured salmon at Cove to the Texas rice in Haven’s gumbo. Beaver’s, the gastro-icehouse on Decatur Street off Washington Avenue where barman Bobby Heugel and chef Jonathan Jones jumpstarted their careers, was founded by chef Monica Pope, among others. Pope, Texas’s answer to Alice Waters, has been a seminal figure in the Houston restaurant scene for several decades, single-handedly starting Houston’s farmers market movement. Considering that she’s run four fine-dining restaurants over the years, it’s odd that her enduring legacy might turn out to be this hip icehouse with creative bar snacks—try the duck and chicken taquitos, the tempura pickles, a great burger, excellent mac n’ cheese, or grilled watermelon salad. Left, Eatsie Boys Café; Right, Eatsie Boys’ Matzo Ball Pho. 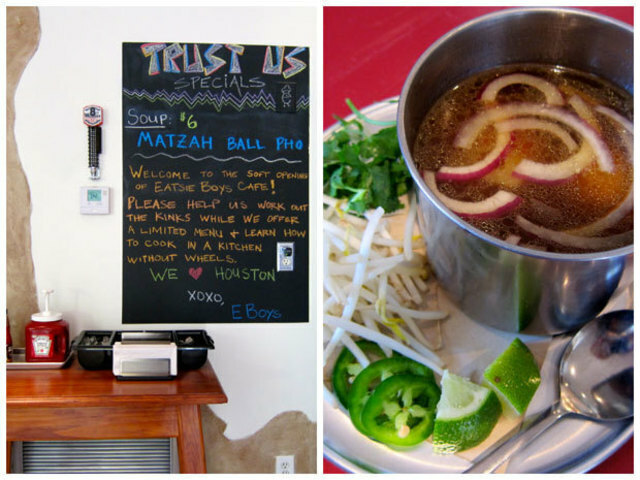 Nothing sums up the Eatsie Boys Cafe like matzoh ball pho—what do you expect from Jewish kids who grew up eating Vietnamese food in Houston? Eatsie Boys is the favorite restaurant of Houston rap superstar Bun B and home to an inimitable Shipley’s Do-Nut ice cream, made with real bits of glazed donut. 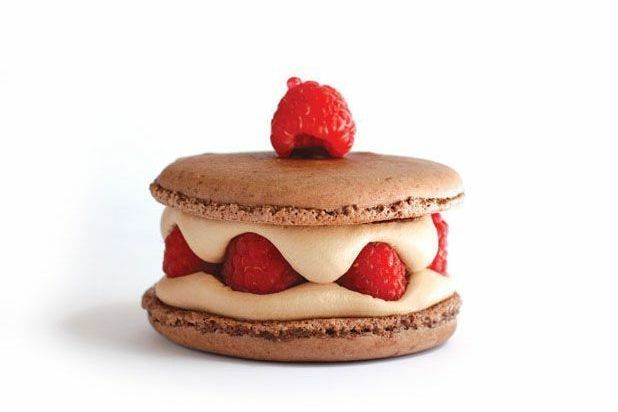 The inviting Montrose cafe is an intentionally low-key retreat where chef Matt Marcus—a veteran of The Fat Duck, a Michelin three-star restaurant in England—can serve the sort of sandwiches, soups, and salads that form the basis of Houston’s casual, everyday cuisine. Watch for sneaky twists like white miso vinaigrette in the kale salad and “Srirancha” (that’s Eatsie Boys lingo for “Sriracha ranch dressing”) on the fried chicken sandwich. Ziggy Gruber says that his Galleria deli on Post Oak, Kenny & Ziggy’s, is “the best New York deli in America,” and he isn’t kidding. The once-proud fixtures of Gotham, he says, are little more than tourist traps these days. “All the third-generation deli guys in New York are doctors and lawyers,” jokes the third-generation deli man. Gruber’s grandfather, Max Gruber, opened the Rialto, the first Jewish deli on Broadway in Manhattan, before Ziggy was born. Today, as he carries on his family’s Hungarian traditions in the Galleria area, Ziggy is hands-on in the kitchen, curing his own corned beef and chopping extra roasted chicken skins into his stupendous chopped liver. His new Reuben burger, with house-made corned beef and Pat LaFrieda premium ground meat, is incredible. Don’t miss his grandfather’s goulash either. Max’s Wine Dive is a driving force behind the “classy comfort food” movement in Texas. The fried-chicken-liver poor boy is brilliant, and if you want to know what kind of wine to pair with a “haute” dog—a beef frankfurter slathered with chili and topped with cotija cheese—this is the place that will help you figure it out. The original restaurant on Washington Ave., which still serves the champagne and fried chicken it became famous for when it opened in 2006, is still packed at every meal. There are now locations in Austin, San Antonio, and Dallas, with more on the way (including a second in Houston). 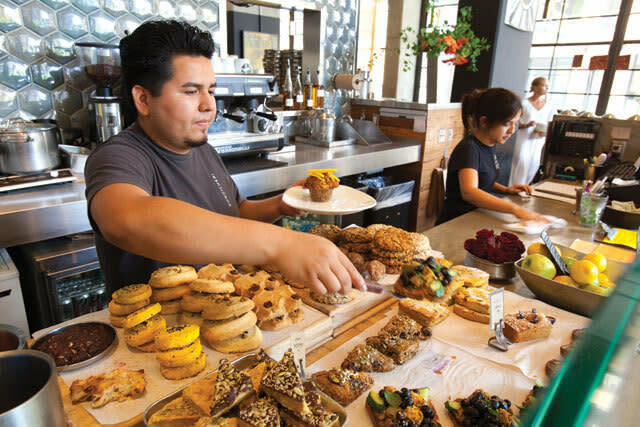 The Heights cafe called Down House (named for Charles Darwin’s English estate) epitomizes the welcome Houston trend of the “useful restaurant,” a reasonably-priced hang-out where one can find breakfast, lunch, and dinner fare with barista-made coffee and craft cocktails. Chef Benjy Mason's kimchi burgers, shrimp tacos, and casually elegant dishes like Gulf shrimp and grits with pho broth are available at nearly any hour of the day, and in a comfortable space that welcomes breakfast meetings and afternoon couch-surfing. Owner Chris Cusak is busy looking for more Heights locations. The crab tostadas and red chile beef nachos at RDG+Bar Annie are holdovers from the restaurant’s predecessor, the late, great Cafe Annie. Of course, those dishes remind us of the 1980s, when the new Southwestern cooking style overthrew European haute-cuisine snobbishness. Some critics dismissed the food then as glorified Tex-Mex, but it shifted the focus from Europe to our own backyard, where we discovered our deep Latino roots. 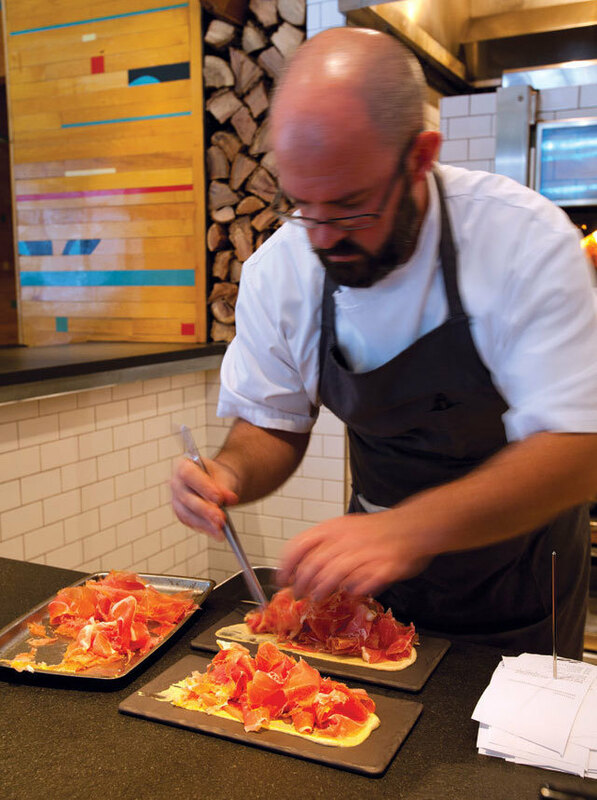 Modern locavores tend to forget that chefs like Robert Del Grande were sourcing their ingredients from local farmers and ranchers 20 years ago. 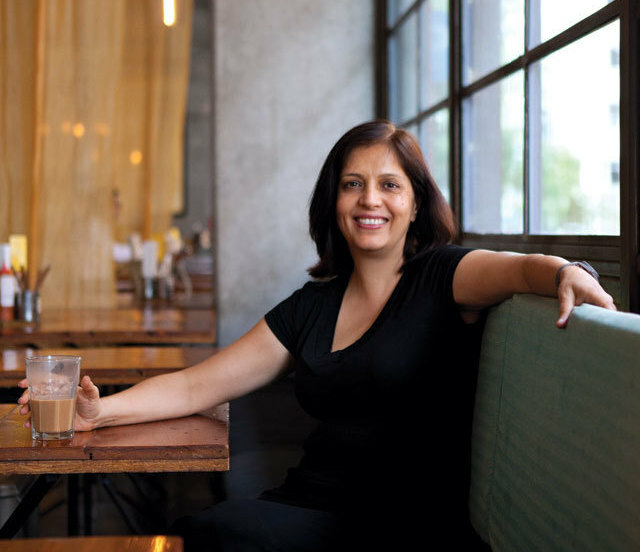 Indian-born Anita Jaisinghani was once the pastry chef at Cafe Annie. Asked what kind of food she serves at Pondicheri on Upper Kirby and her fine-dining restaurant, Indika on Westheimer, she demurs: “It’s my interpretation of regional Indian food using local and seasonal ingredients.” Asked how foie gras with fig chutney is regional Indian food, she responds, “Well—it’s really my personal journey in Indian cooking.” You can start your day with a breakfast of stoneground grits and cauliflower topped with yogurt and chopped peanuts or a saag paneer omelet at Jaisinghani’s modern “chaat shop” Pondicheri. 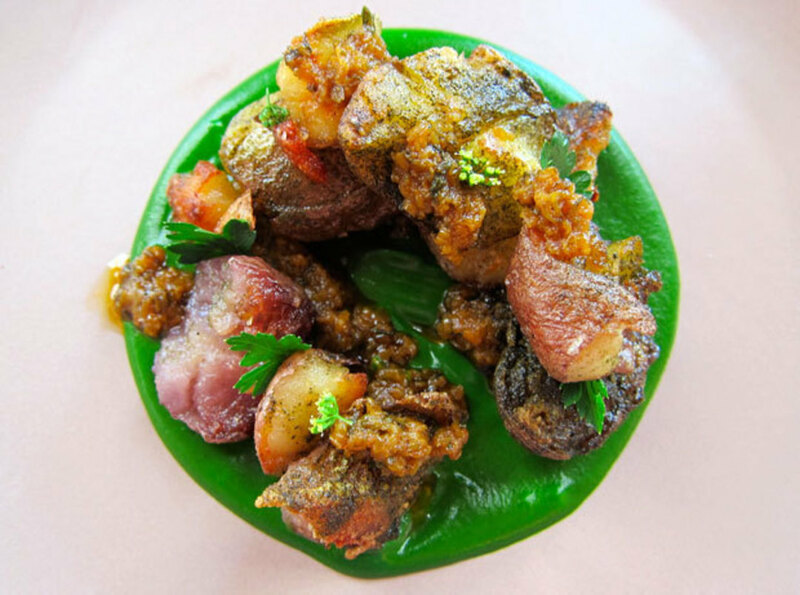 Or you can have a bowl of masala-spiked borscht and a dish of quail tandoori stuffed with pine nuts and caramelized onion masala at her fine-dining restaurant, Indika. 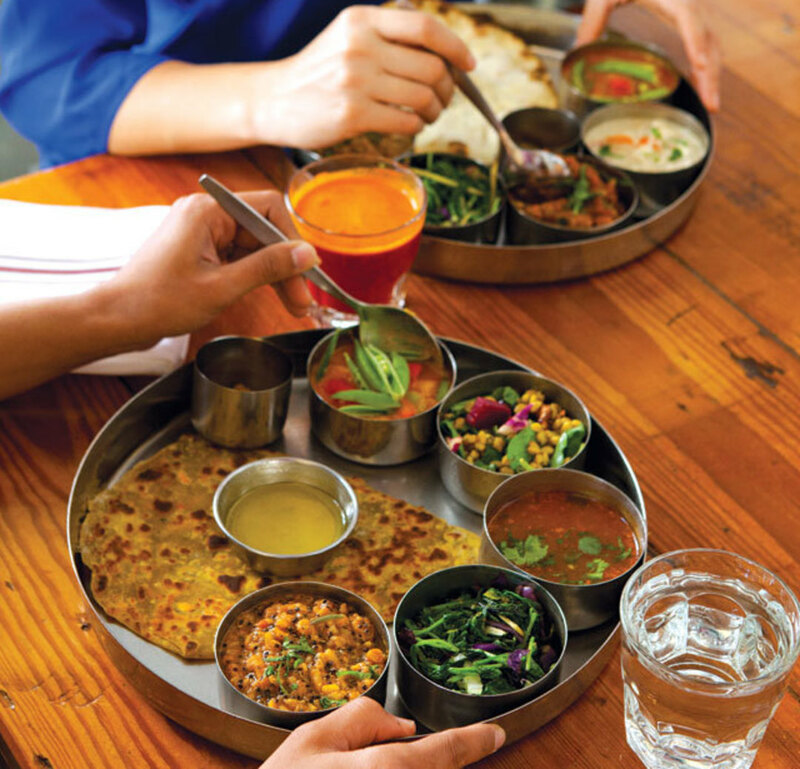 Despite the chef’s modesty, these are two of the most innovative Indian restaurants in the nation. At The Queen Vic, chef/owner Shiva Patel serves Indian pub grub with a Gulf Coast bent—try the masala lamb burger with Texas blue cheese made from goat’s milk, or Goan curry with Gulf seafood and fried okra. If you order the chutney sampler, you’ll find standard tamarind and mint chutneys alongside a ramekin filled with what is more like Indian guacamole, which is perfect with The Queen Vic’s fresh-baked garlic naan. Along with many an American craft beer, there are plenty of British ales and bitters on tap at the Upper Kirby pub. One of the main attractions at Backstreet Cafe on Shepherd near West Gray—also helmed by chef Ortega of Hugo’s, along with his wife, Tracy Vaught—is the patio seating in the big backyard of the restored River Oaks manse that houses the restaurant. The other is Backstreet’s pioneering seasonal American menu—which also includes thoughtful vegetarian and gluten-free dishes—as well as smart beer-and-wine list that, like the food, features a little something for everyone. 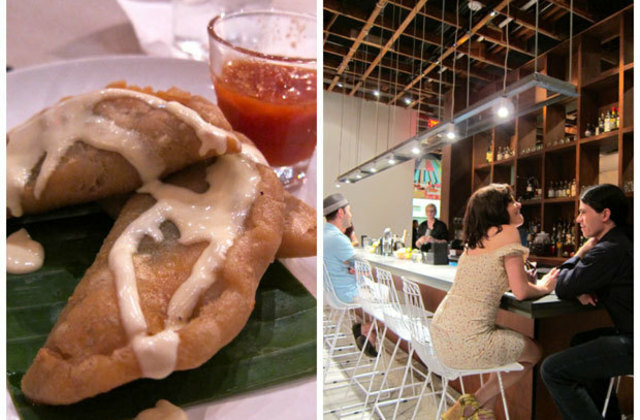 Owner Ana Beaven has brought a taste of her native Mexico City to Houston with Cuchara. The food and decor—especially the colorful murals from Beaven’s sister, Cecilia—are both vibrantly modern and deeply rooted in the culinary traditions of interior Mexico. The aguas frescas are complimentary at lunch, and the all-female line cooks whip out updated renditions of mole verdes, chilatole, and salsas that would delight any abuelita. 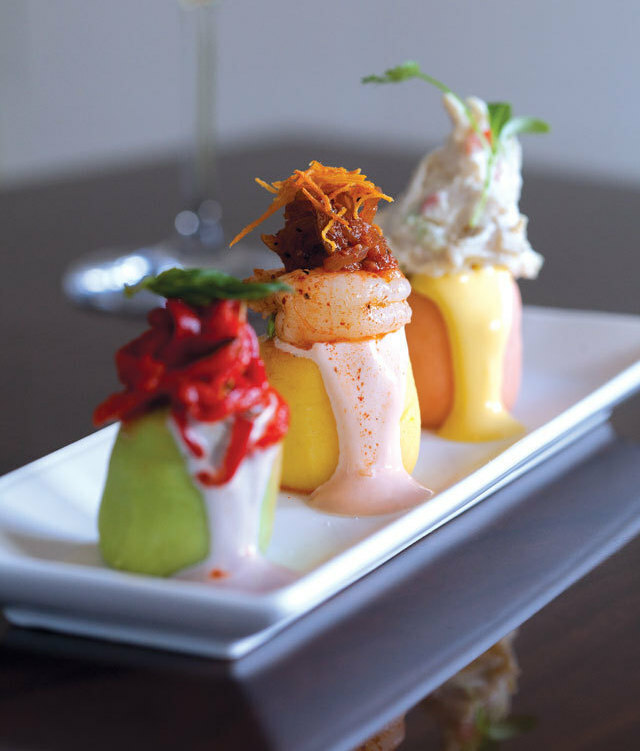 When he opened Latin Bites in the small, 30-seat restaurant that now houses Oxheart, Peruvian-born Roberto Castre figured his modern Peruvian cooking would be a tough sell in Houston, but he was wrong. “You can find a lot of different cultures here,” he says, “and that helps a lot because people are more open to trying different types of foods.” In fact, the city has been so receptive to Castre’s causas, tiraditos, and Peruvian ceviches that Latin Bites relocated to a swanky new space in Tanglewood. Castre has developed such confidence in Houston’s palate, he has plans to open a standalone cevichería next. At La Fisheria, chef Aquiles Chavez—best known for his appearances on Latin American cooking shows and reality programs—focuses on coastal Veracruz cuisine with a dazzling variety of ceviches, seafood cocktails, and modern Mexican entrees like achiote-rubbed red snapper with mashed sweet potatoes and xnipec. Try the shrimp cocktail served in a michelada. The crowded Heights-area restaurant has a bubbly, fun atmosphere, a perfect fit with both Chavez’s personality and his food. At the Original Ninfa’s on Navigation, chef Alex Padilla and an ownership group including Anvil’s Bobby Heugel preserve the Tex-Mex restaurant’s fajita and green sauce legacy while upgrading the menu with new specials like rabbit in red chile sauce, a tasty fajita burger, and exciting agave cocktails. But Mama Ninfa Laurenzo’s old place is facing competition from a new next-door neighbor—her son and grandson have built a new El Tiempo alongside her old place in the Second Ward. Though El Tiempo is run by Ninfa Laurenzo’s family members, they are legally barred from using the Ninfa’s name. 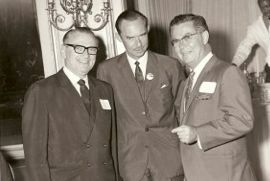 (The family sold the chain and the trademark many years ago.) And judging by the scale of the newly built palatial location in the Second Ward, it would seem the family is intent on squashing their grandmother’s landmark. A taste test reveals very little difference in the tacos al carbon, salsa, and frijoles served at the two restaurants, so you don’t have to choose sides in a family feud. Go to whichever establishment has a shorter wait—or visit one of the other El Tiempo locations. Chef Michael Cordúa launched the Latin American steakhouse trend in Houston with Churrascos in 1988, popularizing grilled, thin-cut tenderloin and the luscious South American steak sauce called chimichurri. Instead of tortilla chips, the restaurant puts a basket of plantain chips on the table. The steakhouse was modeled on the popular El Churrasco steakhouse in Cordúa’s hometown of Managua, Nicaragua. The chef and his family went on to build several more Houston restaurants including the temple of Latin fusion called Américas, with locations in River Oaks and The Woodlands. 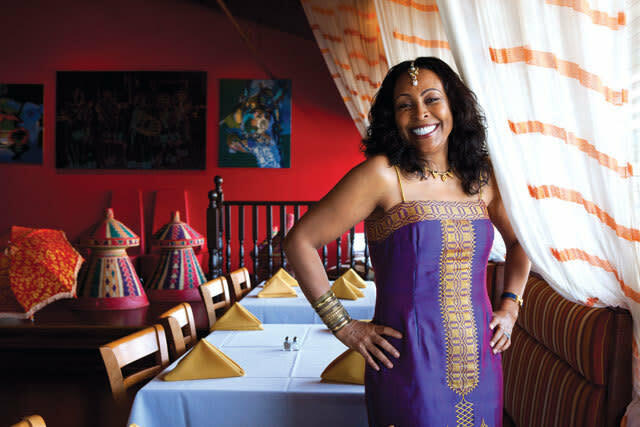 Owner Suzani Grant thoughtfully includes tacos and burgers on her menu at Lucy, which otherwise specializes in traditional Ethiopian fare served in a chic, upscale setting. 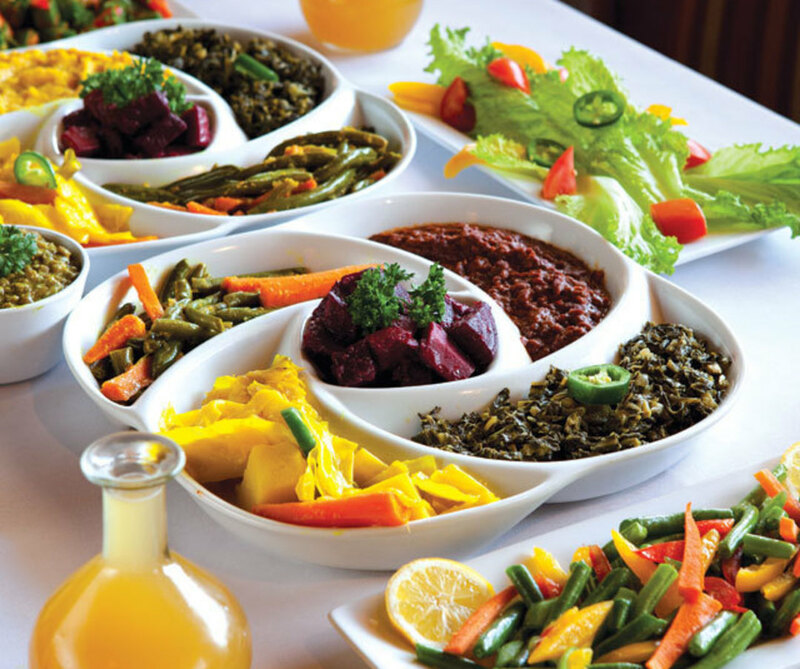 Those who have come to Lucy in search of doro wat and injera can enjoy them on the low wicker tables called mesobs or in the main dining room, which turns into an informal dance club on the weekends. Either way, they’ll enjoy the thoroughly modern vibe and well-stocked bar. When Justin Yu came back to Houston from Copenhagen and opened Oxheart early last year, detractors claimed that a multicultural, vegetable-focused, tasting menu–only restaurant in the rundown Warehouse District just wasn’t going to cut it. But those who’d tasted Justin Yu’s startlingly modern, clear-headed cooking at pop-up dinners—or followed him on his blog as he “staged” his way through Europe—knew the naysayers would be proved wrong. 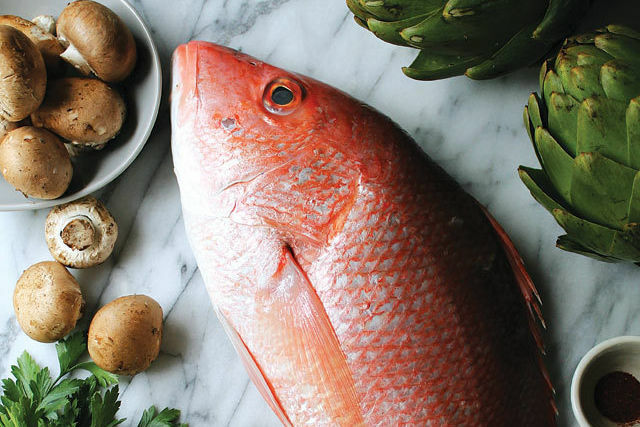 Yu’s intensely focused cooking style coaxes out the best and brightest flavors from Gulf Coast bycatch fish, as well as fruits and vegetables from local farms. With a nearly three-month waiting list for a table, it’s safe to say Oxheart is going to make it. At chef Philippe Schmit’stwo-story flagship restaurant Philippe, he blends his two favorite cuisines: French and Texan. His former restaurant, Bistro Moderne in the Hotel Derek, was once the best French restaurant in the city, but sadly, its sophisticated French-cuisine “inside jokes” (like the avocado and crabmeat bombe) failed to win the city over. Regardless, by the time the bistro closed, the chef known as the “French Cowboy” had fallen in love with his new hometown, so now he’s back in the saddle in the Galleria area, serving amazing creations like duck confit tamales and foie gras po’ boys. Cold seafood dishes are a specialty of French brasseries, and the elegant Brasserie 19 is no exception.There’s a great oyster-bar selection and a wonderful seafood salad with shrimp and lobster, complemented by an excellent wine list that’s long on French whites. But this is Texas, so there’s also a zesty ceviche, and the plateau de fromages features French—and Texan—cheeses. 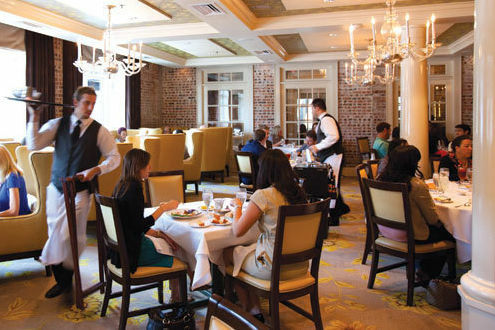 The country club–chic dining room and pricey plateaux de fruits de mer have made the River Oaks restaurant a preferred destination for the city’s rich and pretty. Que Huong, the city’s best Vietnamese restaurant, recently moved from cramped quarters on Wilcrest to a nicely furnished location in Hong Kong City Mall on Bellaire in Chinatown. Tempura soft-shell crab salad is a standout on a 300-plus-item menu that also includes what some claim is the best bun bo Hue in the city, as well as ten goi (cold salad) dishes—including a surf-and-turf combo of shrimp and steak over raw water-spinach leaves. The com tam (crushed rice) plate, with your choice of grilled or shredded pork, a stuffed tofu skin roll, Vietnamese quiche, or a fried egg, makes a great brunch. The owner’s son runs Le Viet on Westheimer near Wilcrest, an excellent Vietnamese restaurant with a shorter menu of greatest hits. Bright red furniture and gold-painted dragons decorate the dining room of Fung’s Kitchen on the Southwest Freeway near Bellaire, and the walls are lined with aquariums containing live lobster, crab, prawns, scallops, turbot, and ling cod. 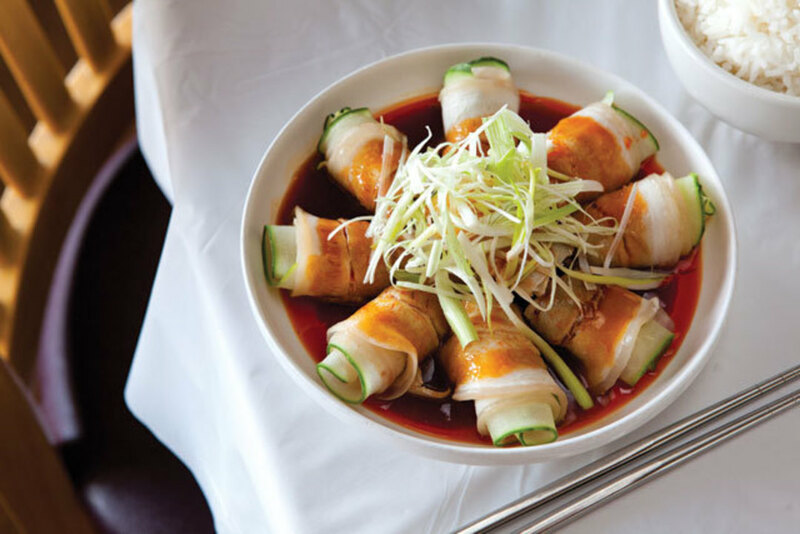 “We serve Hong Kong-style Chinese food,” says chef/owner Hoi Fung, who comes from a family of chefs in the region. What’s the difference between Hong Kong and Houston ingredients? “Live seafood is our specialty,” chef Fung says. “In Hong Kong they get farm-raised fish—here we get wild. Wild seafood tastes better.” Fung’s Kitchen is a favorite for dim sumon weekends, weddings receptions, and other celebrations, including a wonderful Chinese New Year’s feast. And guess where the emperor of Japan’s daughter and her entourage ate when she visited Houston a few years ago? 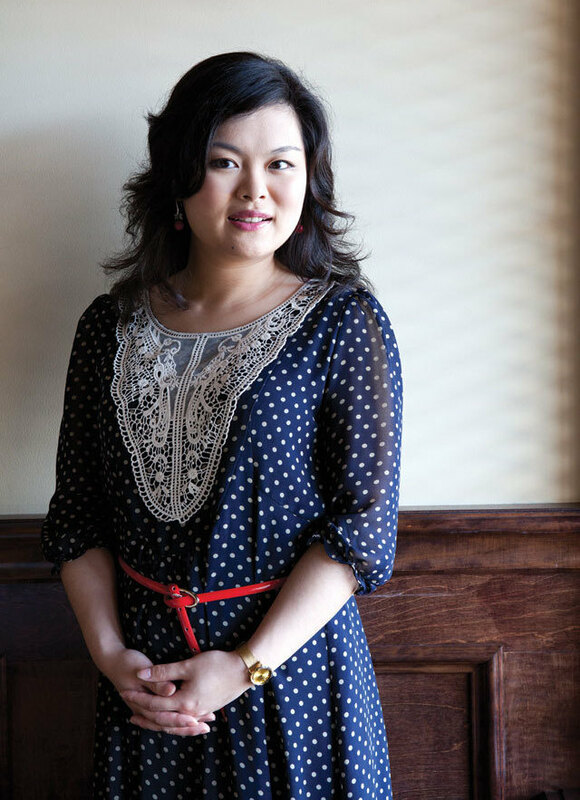 Born in China and educated at the University of Texas at Austin, Cori Xiong, the young co-owner of Mala Sichuan on Bellaire in Chinatown, played it safe when the restaurant first opened, offering such standbys as sweet-and-sour chicken on the menu. 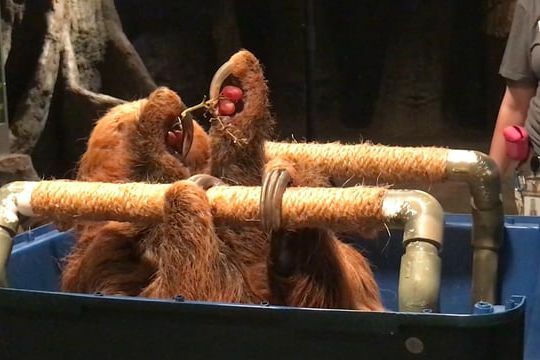 But it was cutting-edge items like “garlic bacon” rolls, part of the Chinese charcuterie trend, and “funky chicken sticks,” shredded chicken and green onions tossed in the spicy orange mala dressing, that she really wanted the restaurant to be known for. The marriage of ma (the numbing tingle of Sichuan peppercorns) and la (the fire of chile peppers) is the signature flavor of Sichuan cooking. As more customers came looking for mala, the sweet-and-sour chicken went south, replaced by some of the most exciting Chinese food in America. Kata Robata on Upper Kirby still has that electric hum of a brand-new restaurant. That’s because every visit is an encounter with the unexpected, be it a species of fish at the sushi bar you’ve never heard of or an innovative presentation like fish and chips served in a basket made of fish bones. The spicy ramen with ground pork is the best in the city. For the ultimate thrill, put yourself entirely in the hands of chef Manabu Horiuchi and order chef Hori-san’s nightly omakase dinner—the elaborate multi-course extravaganza will forever alter your perceptions of Japanese food in Texas. Uchi, the inspired Japanese restaurant in the old Felix location at Westheimer near Montrose, is part of Austin chef Tyson Cole’s Texan-Japanese restaurant empire. 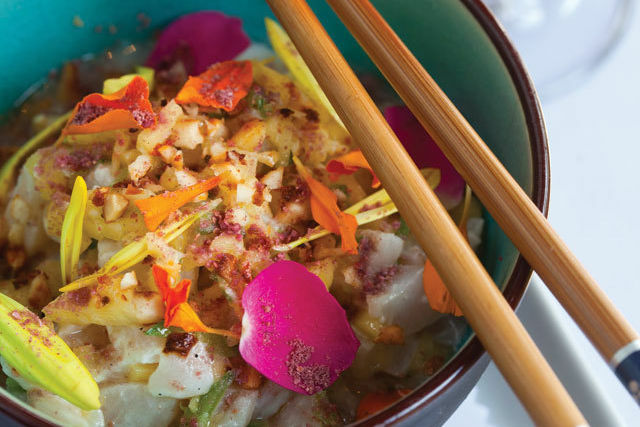 Small plates like oysters garnished with melon, and ribeye steak and shrimp in coconut milk with fennel, are offered alongside Latino sushi bar creations like “uchivichi,”the restaurant’s take on ceviche. Director of culinary operations Philip Speer still insists that the company’s plan is to create outstanding neighborhood restaurants—and eclectic Montrose has welcomed the equally eclectic “Japanese farmhouse” as if it were homegrown. Chef Gabe Medina brings his Filipino traditions to the Asian food fest at the five-year-old Soma Sushi, which was first opened by celebrity chef Robert Gadsby. Medina has pulled the restaurant out of its Washington Ave. torpor by kicking the sushi bar into high gear and creating the city’s most exciting ramen menu. There are several traditional ramen presentations and some unusual variations like seafood ramen with shellfish and black bean ramen garnished with the scrambled egg sushi called tamago; all the ramens are outstanding. A recent well-received weekly special was Texas ramen, featuring juicy slices of brisket and smoked pork belly with kimchi. At Korea Garden, located on the western stretch of Long Point known as Koreatown, a generation of Houstonians learned about bibimbap, seafood pancakes, and Korean barbecue delicacies like grilled short ribs and grilled squid. Kimchi cabbage, kimchi cucumbers, and spiced potato chunks were close enough to coleslaw, pickles, and potato salad to pass. And if barbecuing the marinated rib-eye steak called bulgogi on a grill in the middle of the table wasn’t already Texan, well, it is now. Benjy’s two ambitious young chefs have brought the restaurant out of its former “Pacific Rim fusion” funk and into some new and exciting territory. Chef Joseph Stayshich, formerly of *17, works at the newly-remodeled original location in Rice Village, turning out Houston-centric fare like Dr Pepper-braised short ribs with taquería-style local vegetables and saffron risotto with Gulf shrimp and house-made chorizo. Meanwhile, at the Washington Ave. location, Japanese-Lithuanian chef Mike Potowski, formerly of Noe, serves dishes like kimchi potstickers, sake-cured grilled salmon with sour plum yogurt, and Japanese fried chicken with Texas okra. At Coppa on Washington Avenue, chef Brandi Key has created a menu that represents the evolution of Italian dining in Houston. You’ll find everything from old-school meatballs al forno to gleefully modern octopus carpaccio with mizuna and pickled Fresno chiles. The “Italian mixed grill” includes saba-marinated quail, Gulf shrimp, and a Parmesan polenta pudding. The restaurant is well known for its carefully curated list of interesting Italian wines. The Italian food in Texas and Louisiana has long taken its cues from old-fashioned Sicilian. Chef Marco Wiles bucked tradition when he opened Da Marco, a cozy Montrose trattoria that serves food that might remind you of the modern Italian cooking style of Mario Batali in New York. 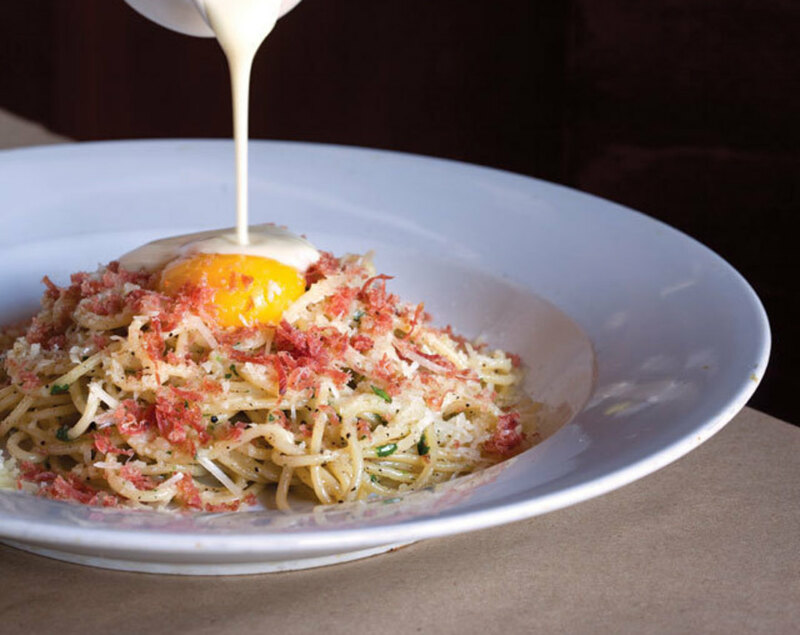 Da Marco and its two sister restaurants, upscale pizzeria Dolce Vita and salumeria Poscol, are havens for Houstonians who love risottos, salumi, thin-crust pizza, and all the other delicacies of Northern Italian cuisines. Da Marco’s seasonal celebrations are highly recommended; this year for the holidays, he’s teaming up with Italian chefs to recreate the menu of a Venetian restaurant. Damian’s has navigated Houston’s tumultuous waters for over 30 years while remaining a vanguard of classic Italian-Gulf Coast cooking, making it the Mandola family’s oldest surviving restaurant. Chef Napoleon Palacios serves red-tablecloth standards such as veal piccata and spaghetti Bolognese alongside dishes such as grilled snapper Butera and “asparagus Mike Wells”—it’s an honor to get a dish named after you here—both crowned with that most Houston of toppings: jumbo lump crab meat. 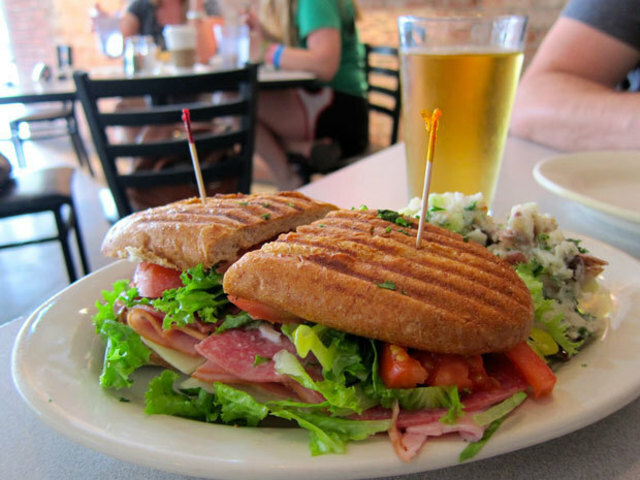 Second-generation restaurant owner Paul Petronella has lately taken Paulie’s on Westheimer near Shepherd from a pleasant Italian cafe to a highly recommended dining destination by keeping it fresh and local. His sensational house-made pastas are found in restaurants all over town. The house-baked cookies are great too, especially with Greenway Coffee and Eatsie Boys gelato, and there’s also a smart wine list (not to mention a new adjoining wine bar, Camerata). 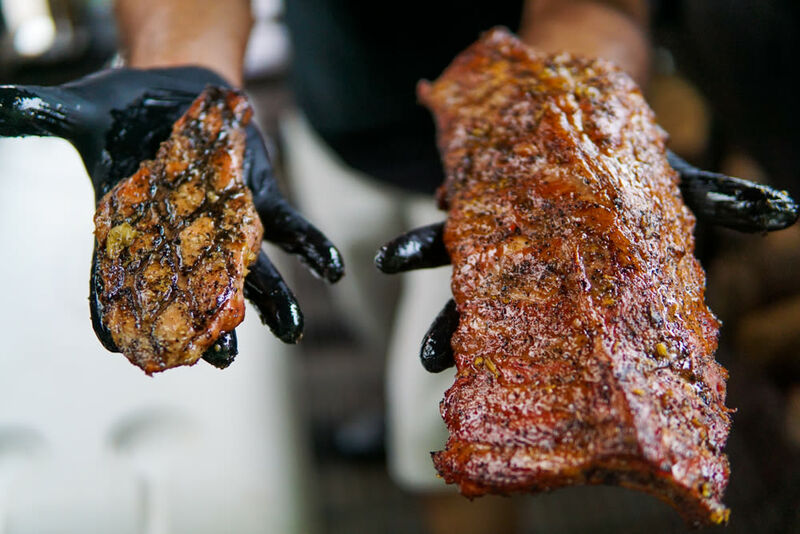 Houston is America’s most exciting restaurant city, but don’t just take our word for it.